Mr. Pavlo Klimkin is a Ukrainian diplomat who since 19 June 2014 has served as the Minister of Foreign Affairs of Ukraine. 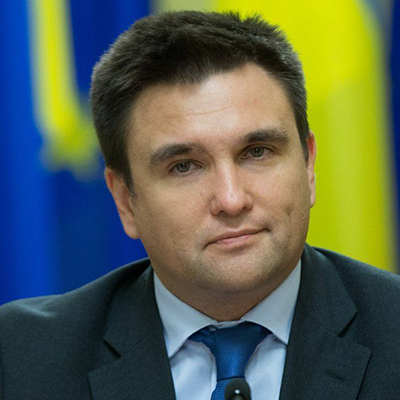 Mr. Klimkin started his career at the Ukrainian Foreign Ministry in 1993. Ever since his entry into the diplomatic corpus he has held the positions of an attaché and second secretary in the department of military control and disarmament. also worked in the departments dealing relations with Germany. Mr. Klimkin was appointed Minister-Counselor of the Ukrainian Embassy in the United Kingdom in 2004, a position he held until 2008. In March 2008 he was named the Ukrainian Foreign Ministry’s director for their European Union department. On 21 April 2010 he became Deputy Foreign Minister in the First Azarov Government of Ukraine. As deputy Mr. Klimkin played a central role in negotiating the Ukraine–European Union Association Agreement, particularly in its early stages in 2012. Minister Klimkin is fluent in English and German and has basic knowledge of French and Spanish.